The postcard stamp rate for domestic postcards in the USA will increase from 34 cents to 35 cents on May 31, 2015. Thank you, Letter Writers Alliance, for alerting me to this surprise change! Read all about it on the LWA blog. Essentially only metered mail (and eww, ick, who uses that for fun mail?) and postcard stamps will increase in price. I searched for new 35-cent postcard stamps but haven't found any yet, so I sense this change went through pretty quickly. Well, add on some 1-cent stamps to those USA postcards, and cross your fingers that the new postcard stamp design will be as awesome as the current hummingbirds. UPDATE: thanks so much to FinnBadger for alerting me to some more information about the new stamps: New US stamps planned for new rates. Very interesting concept: postcard stamps will now be "Forever" at the postcard rate, as will additional ounce stamps. I am still undecided as to how I feel about this. Thoughts, anyone? Note that they are going to be issued as postcard rate stamps which will be valid forever. And there are a few more of these 'forever' you're stamps for the additional ounce, 2oz, and 3oz rates. There's a new non machinable stamp (for 1oz non machinable letters), although this us the same as the 2oz rate so it's a bit odd. I like all the new definitive stamps, they're an attractive bunch. Thanks so much for this link, FinnBadger! Interesting stamps and a very interesting concept of "forever" postcard stamps (and additional ounce, etc). You bet. This change was initially supposed to happen on the last Sunday in April, but USPS botched some of the paperwork for the metered mail rates, and decided to delay the other changes until they were all approved. The post office has had forever pre-stamped postcards for a while, so I suppose it was inevitable they'd go this route with the actual stamps. It does give customers convenience (always valid, don't have to worry about buying small denominations of stamps, small savings if you buy ahead of a rate change), and saves the post office a ton as it costs the same to produce a 1c stamp as it does to produce any other stamp that size, and they don't have to sit with a ton of unused stock when a rate change happens. The only one that I think seems odd is the non-machinable surcharge stamp - unless you know enough about rates you'd have no idea that it is also fine for a 2oz machinable letter. My favorite is the penguins on the additional ounce stamp (22c). Oh, and international letters & postcards are going up on sunday as well - they will increase by 5c to $1.20. Of course, there is already a global forever stamp. Not sure where I read it first. Stamps.com has a good list. I'm still not sure how additional ounces will be priced for international mail. And yes, the post office has been really slow to release info. I expect there'll be a lot more on their main page this week. Oh, I do know there have been a lot of senior staff changes at USPS which may have caused delays in info coming out as far as stamp services is concerned. Very interesting - thank you so much for all this information! I knew about the rate changes because my workplace uses a postal meter and we get updates constantly. I didn't know the postcard stamps would be Forever, but I'm thrilled with the designs. A bit weird for people who are using them for wedding Save the Date or RSVP postcard, though. Birds tend to be a "trigger" issue. My daughter, who never had anything bad happen to her with birds, is terrified of them. I didn't know about the other definitive though and I am off to oh and ah over them now :) Thank you! It does tend to be a lot of birds. Too bad about that, though the designs look interesting enough. Oh! I did the math and two Forever plus the new additional ounce penguins is international rate! That will look so nice on the Postcrossing postcards! I usually use vintage for the additional postage but often that requires five, or more, stamps if I am low on vintage. Three pretty stamps leaves lots more room for all my other decorating! Oh fabulous! I often parcel out postage on Postcrossing postcards like you do - especially for stamp lovers - and this is good to know. I am a big fan of those penguins. Also the forever rate plus the 2oz or non machinable rate also equals the international rate. Yes, this adds up nicely! The two low value stamps have been quietly added to the USPS store under the less than 49c tab. Great catch, FinnBadger - thanks so much! Looks like I'll be pre-ordering some of those VERY soon. Thanks for all the info! I love the new postcard stamps! Yikes! I'm so glad you posted about this--I missed the LWA post. We use a meter at work and I can imagine all the returned mail we'd get if we didn't update our meter! I hope LWA does a cool postal changes infographic like they did the last 2 years. Indeed! Me too! I LOOOVE their illustrations and infographics. And now the USPS site has the higher non-denominated new stamps up - new butterfly stamp, new 3oz stamp, and re-issues of Yes I Do, Wedding Cake and Vintage Tulip at the 2oz rate. Like many people, those penguins are also my absolute favorite, although I do love the butterfly series. Thanks for the head's up! I was just on vacation using my postcard stamps! Glad I got them all sent in time. I like that they're switching to more Forever stamps in the different rates, both with like postcard that I mainly use on vacation and I'm thrilled the Tulip love one is now forever 2 oz, someone I write really likes tulips, so being able to stock up appeals to me! Sarah, I love that tulip stamp, too, and am delighted to see it continued. When postcards went to 34 cents, I started a project to get a postcard from every US state, using the 34 cent Greetings from America stamps. It took 16 months to complete because some people didn't follow-through and the Post Office lost a good many stamps and postcards. 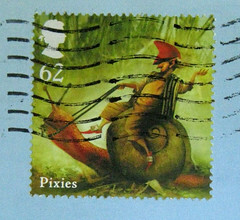 The final postcard came in with an extra penny stamp on it and that was the first I heard it had changed. Marlo, I loved using those 34-cent Greetings from America stamps as postcard stamps, too. I have a fairly extensive supply of bobcat 1-cent stamps, so I'm going to keep on using them with the bobcat addition. Your project sounds fun. Not surprised some folks didn't follow through (! ), but glad you got it completed.